the solution. I got stuck in traffic on the way home, and when I finally crawled into my house, exausted – my four three children were eating crackers for dinner looking at me with puppy eyes. enjoying a beautiful and flavorful meal. Mix sour cream with mustard, tarragon,shallots and mustard. Leave for 10 -30 minures alone, for flavors to develop. (I just needed to sit on my balcony and relax, watching the rain). Place salmon fillet in the roasting pan, sprinkle the fillet with salt and pepper. Rub garlic over it, and spread a layer of the sour cream mixture on top and on the sides, to seal the fish. 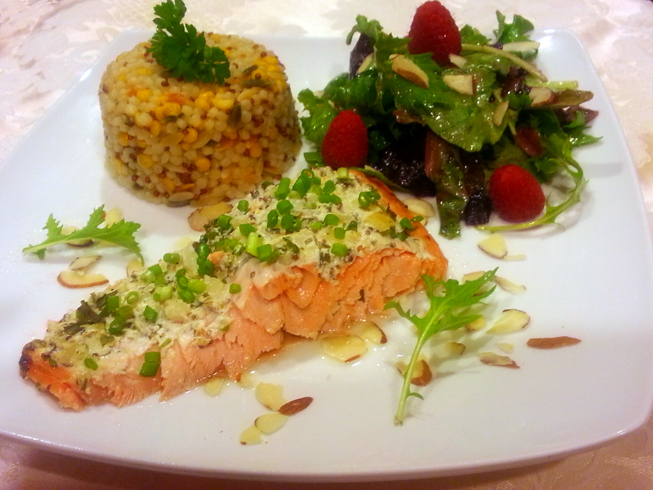 While the Salmon is baking, have a glass of wine, cook the grains and mix the dressing.